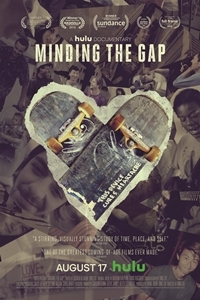 Description Compiling over 12 years of footage shot in his hometown of Rockford, IL, in MINDING THE GAP, Bing Liu searches for correlations between his skateboarder friends' turbulent upbringings and the complexities of modern-day masculinity. As the film unfolds, Bing captures the deterioration of 23-year-old Zack's tumultuous relationship with his girlfriend after the birth of their son, and 17-year-old Kiere's struggle with his racial identity as he faces new responsibilities following the death of his father. While navigating a difficult relationship between his camera, his friends, and his own past, Bing ultimately weaves a story of generational forgiveness while exploring the precarious gap between childhood and adulthood.